For the launch, this Daily E6 35-160 Hi-Matic van was helicoptered to the top of the Heilbronner with Mont Blanc in the background. It is only a little over a year since Iveco launched the third generation of the Daily which was a ground up development of the rear wheel drive, separate chassis, front independent suspension, wide range concept that had first been introduced in 1978. This was superseded in 1999 by models that were the first commercials with common rail engines. The Daily E6 retains the same chassis with developments of the engine and a number of body enhancements. In the 38 years to date, over 2.8m Daily variants have been built around the world. €500m was spent developing the third generation and roughly a further €100m has now been spent upgrading the range to satisfy Euro6 regulations and introduce other steps forward for the Daily E6 including innovations in connectivity and measures to further reduce total cost of ownership. To launch the original Daily, Iveco dropped a van from a plane by parachute and for this occasion they went in the opposite direction, holding a press conference half way up the cable car journey from Courmayeur to the 11,358ft/3,462m summit of the Helbronner in the Italian Alps. Afterwards, the press went on to the top where a Daily E6 35-160 Hi-Matic van had been landed by helicopter and was displayed against a backdrop of the peak of Mont Blanc (or Monte Bianco as it is known in Italy). 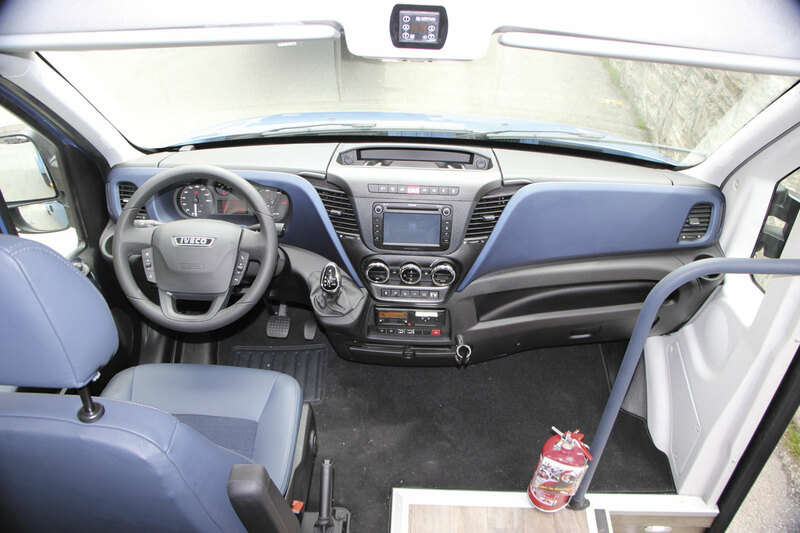 The Iveco Daily E6 Tourys 19-seat coach. 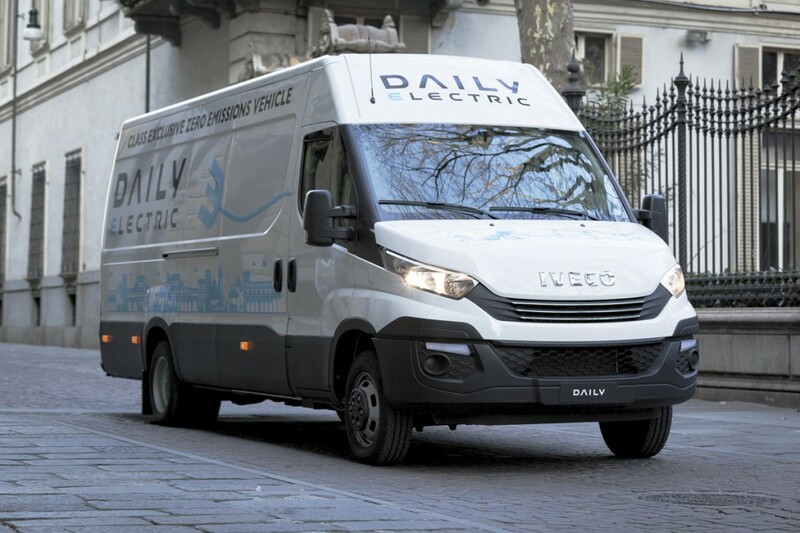 Introducing the new model, Iveco brand spokesman, Pierre Lahutte, said that Iveco’s values and the motivations behind the Daily E6 were technology, sustainability, low total cost of ownership and business partnership. He stressed the quality built in and said that the company’s quality programme was really paying off. 2015 saw Daily achieve an 11.3% share of a European van and light truck market totalling 463,000 units and he predicted that total, and Iveco’s share of it, would rise in 2016. Daily sales were up 20% on 2014 and a similar level of growth is anticipated this year. Imposing and distinctive, the Daily Tourys looks very different from earlier generations. I fear the rear wheelarches are a bit too prominent. There are said to be over 6,000 possible factory combinations within the Daily range which includes both single and twin rear wheel chassis and complete vans, trucks and minibuses. Of the complete directly Iveco supplied market, the main attraction for readers is the 6.5 tonne minibus range where the top of the range product is the Daily Tourys coach which can be supplied with up to 22 seats (plus courier) and up to 2.5 cubic metre rear luggage boot. 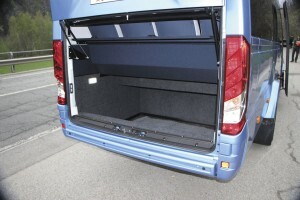 As standard, the Tourys has a coach rear with boot and large window. Minibuses accounted for 2,310 unit sales in Europe in 2015, which Iveco calculate is 12% of the market, their best performances being in Italy where they enjoy a 46% share, France (32%) and Spain (31%). 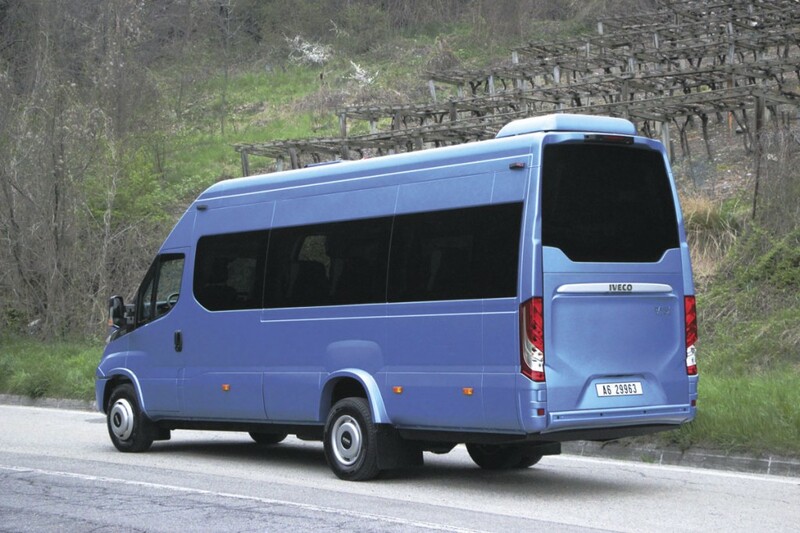 The split between minibuses sold as complete vehicles by Iveco and minibuses supplied as chassis and then made into minibuses is approximately 60/40. Iveco works with around 50 bodybuilders in Europe, the Middle East and Africa including Israel. 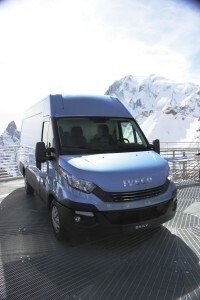 Iveco also supplies vans specifically for conversion to minibuses. The nominally five tonne versions intended as minibuses are homologated to M rather than N standard and therefore have a permitted GVW of 5.6 tonnes rather than 5.2 tonnes, though there is physically no difference between the two. As was the case at Euro5, there are two engine families, both of which are four-cylinder. 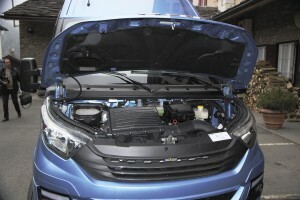 The F1A is a new 2.3-litre unit available with power outputs of 120hp, 140hp and 160hp that is said to have been re-engineered from the sump up. A weight reduced by 6% is one of the results. All variants are only homologated for light duty applications. For Euro6 it has been equipped with low pressure exhaust gas recirculation (EGR) as standard, having previously been SCR-only at Euro5. Significantly, a new multiple jet injection version with simplified after-treatment, scheduled for 2017, will meet the regulations concerning real driving emissions limits, mandated for 2020, some three years ahead of the required date. HiMatic models feature a blue/grey finish to the dash. Already equipped with EGR at Euro5, the larger F1C is a 3.0-litre unit which is offered with outputs of 150hp to 210hp is for light duty applications. The 210hp/150kW unit new, giving a peak torque figure of 470Nm. For heavy duty applications, the F1C is only offered as a 150hp or 180hp unit and only the 180hp can be supplied with the automatic transmission, rather than the manual. At Euro6, the 180hp delivers torque of 430Nm which is a 30Nm increase on the 400Nm of the 170hp unit previously standard. This extra umph comes from the use of new 2000bar low PM injectors, while optimised DPF regeneration has extended oil change intervals. Iveco claim that the changes at Euro6 including longer diesel engine oil change periods (up 25% to 50,000km) will result in 12% lower maintenance costs on top of which Euro6 should deliver an 8% fuel saving. For all bus and coach applications, the important engine is the 3.0-litre F1C because the smaller 2.3-litre F1A is only homologated for light duty applications, and cannot be specified for bus applications. Accordingly, the company will not supply F1A powered vehicles for bus use. 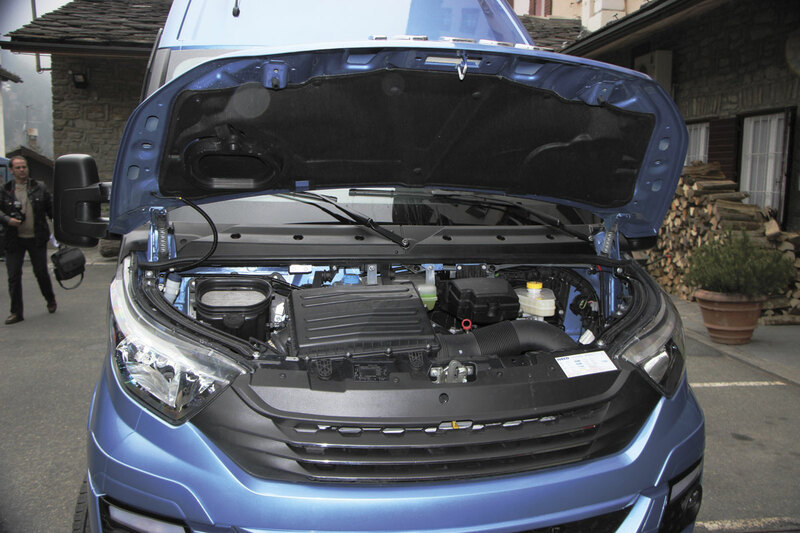 Some converters choose to circumvent this by choosing to convert pre-registered vans, although they risk homologation issues and registration difficulties in doing so. The same ruses and potential problems arise with light duty homologated versions of the F1C, including the 210hp option, though some examples are known to exist. AdBlue usage is expected to be 3-4% of fuel usage and it has been calculated that the 25-litre tank should only need replenishing once every two months for most operations. As well as the diesel options, the Daily can also be supplied as a bus with electric power or with a CNG engine. The electric is rather a niche product (only around 20 electric Dailys were sold last year) but can nevertheless be offered with a choice of 60 or 80kW electric motors, a GVW range of 3.5-5.6 tonnes and either one, two or three battery packs, depending on wheelbase and the range the purchaser requires. There is a weight penalty but apparently some countries, Italy included, give a GVW allowance for electric vehicles. Available across the full 3.3-7.2 tonne range, the CNG fuelled alternatives are based on a 136hp 3.0-litre ‘Natural Power’ unit developing torque of 350Nm which is homologated for heavy duty applications, though it is truck derived. There are two versions: one is CNG only and the other has a petrol engine in addition to the CNG one. The petrol tank has only a 15-litre capacity and is intended as a get you home standby in case there is no gas supply available. It is only available with the manual gearbox. In the unlikely event that you’ve wondered why some third generation Dailys have brightwork highlights to the grille and some don’t, the answer is that the sparklier ones are models equipped with the eight-speed fully automatic HiMatic gearbox as also fitted in Jeep Cherokees and Grand Cherokees and also in certain Maserati models! This box is the reason that Iveco, somewhat ambitiously clam, ‘Drive it and you buy it,’ though the HiMatic, which is available across the range, also brings with it a number of other benefits including optional Driving Style Evaluation which makes real time economy suggestions. The Ecoswitch Pro system which calculates the load and reduces torque when it isn’t needed is only available on 2.3-litre light duty models. 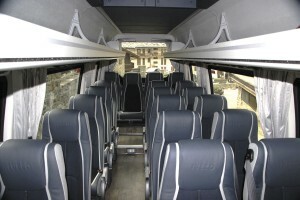 The interior of the Tourys featuring Lazzerini seats. The UK version will feature a sunken aisle, R66 rollover certification and 19 Kiel Avance seats. 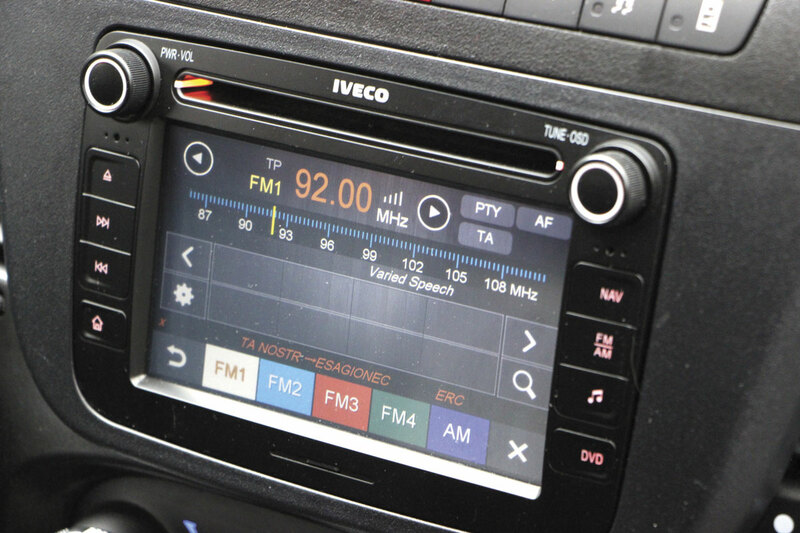 In the first year since its launch, 10,000 Daily customers have opted for the HiMatic, many of them minibus operators. The alternative to the automatic is a five-speed manual transmission. Although the automated manual Agile transmission is still technically available it is not expected to be so for very long because of the superiority of the HiMatic option. A new development across the Daily E6 range is the availability of a Telma LVRS600 electromagnetic retarder with the HiMatic gearbox; it was always required with the manual. Although it is available, Iveco stressed that the additional cost of the retarder is not essential for all minibus applications, because by programming the system to slightly increase the revs when decelerating, the engine brake alone is sufficient to meet the legal requirements without incurring the weight/cost penalty on the 7.0 tonne variants. Standard equipment on the Tourys includes LED interior lights and individual air conditioning vents, while options include a built in SatNav and reversing camera, LCD monitor, a fridge, coffee machine and individual USB ports. There is also a less well specified version called the Line which can be supplied in three lengths with between 16 and 22 seats (without courier). The 22-seat version does not have the boot but the 21 plus driver variant does. Aftermarket converted rear lift equipped versions are also available. Driver comfort has been increased across the range with the driving seat now mounted 15mm lower. The wheel has been reduced in diameter by 20mm and is mounted seven degree nearer vertical which is said to improve handling and comfort. There are minor changes such as the redesigning of some of the storage areas for bits and pieces (there are 18 of them) to make them more accessible, but the most welcome will be a 4dBa reduction in cab noise levels, which, if I’m right that 3dBa is an order of magnitude, means that it should be less than half as noisy as previously. This tablet, smart phone or laptop cradle is one of the connectivity options. 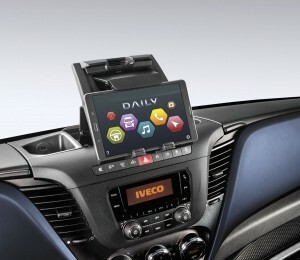 and entertainment systems and equipment and there is an optional adjustable laptop, tablet and smart phone holder. Users will be able to connect their own existing devices rather than buying units that are dedicated to the vehicle. All complete Daily E6 models are built at the Suzzara plant in Italy. Currently some Daily chassis are constructed at Valadolid in Spain but I understand the plan is to transfer this work to Suzzara, although at present the Italian plant is unable to meet the level of demand. Its capacity, currently 300 Dailys a day, is to be expanded. Irisbus supplied bus versions are completed as vans at Suzzara with the power door already in place (if specified) and the windows also installed. They are then transferred to the premises of the independent coachbuilder, Mussa & Graziano, where they are converted. 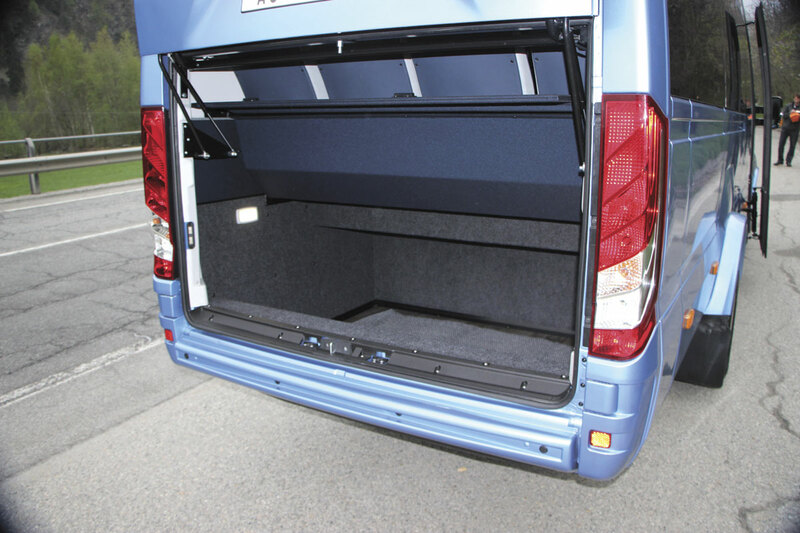 On versions with a rear luggage boot facility, the base vehicle arrives with van doors and the converter installs the luggage area with its cantilevered door and large rear window. 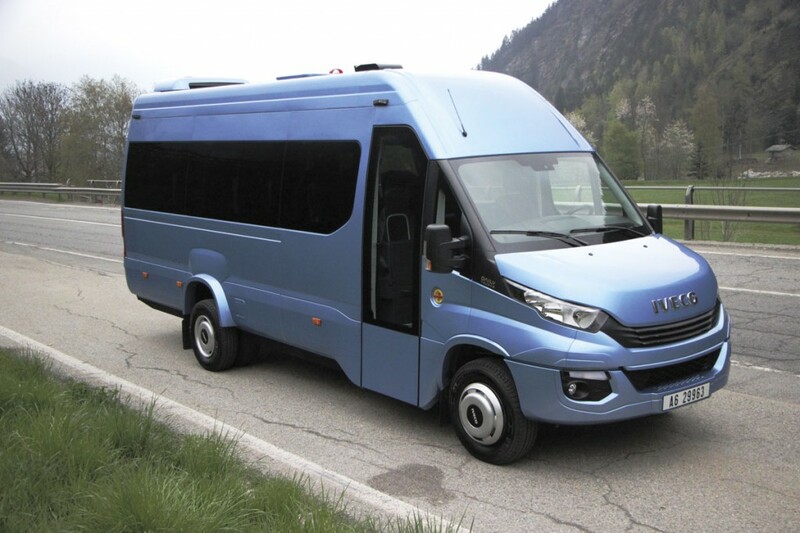 Road tests around the Courmayeur area gave the opportunity to sample the new models, among them the Daily Tourys coach, which carries only the name, not a chassis descriptor. This was mounted on a 6.5tonne GVW chassis with HiMatic automatic transmission and the 3.0-litre heavy duty engine developing 125kW/180hp and torque of 430Nm. This had the 4,100mm wheelbase. 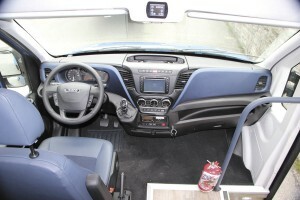 Features included the LDWS lane departure warning system and cruise control. Shown here as a van, electric minibus versions of the latest Daily are available. It did not have the Telma fitted and it was demonstrated that the exhaust brake facility is very effective without it. Changing from the HiMatic was invariably seamless and although it was not fully laden it seemed to have plenty of power, with plenty of torque low down. One bugbear is that it still has the old mechanical handbrake, for now. 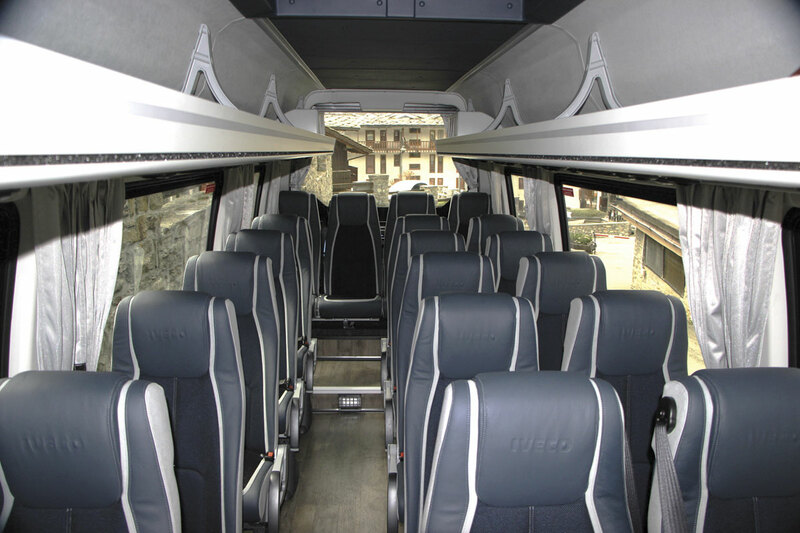 As examined with options including USB points, courier seat, back sensors, reversible air conditioning, and a multimedia system, the European price of this 19 seat coach was €91,500 (£71,187). All Tourys coach models have rear air suspension as standard in addition to the independent front suspension, also standard across the Daily range and if the Italian roads meant that it was still quite lively over the rear wheels, it was infinitely more comfortable than the earlier generation (and presumably non air suspended) Daily we had travelled from Milan to Courmayeur on. The man responsible for the Minibus and Chassis business line of the Daily range is Christophe Longuet, an enthusiastic Frenchman who took on the job after a spell with Iveco’s South African operations. He believes there is a great deal of potential for increased Daily sales in the UK, as Sylvain Blaise, Iveco’s Head of Global Bus, had indicated when I spoke to him last year, though still no sign of anything from the full sized range. 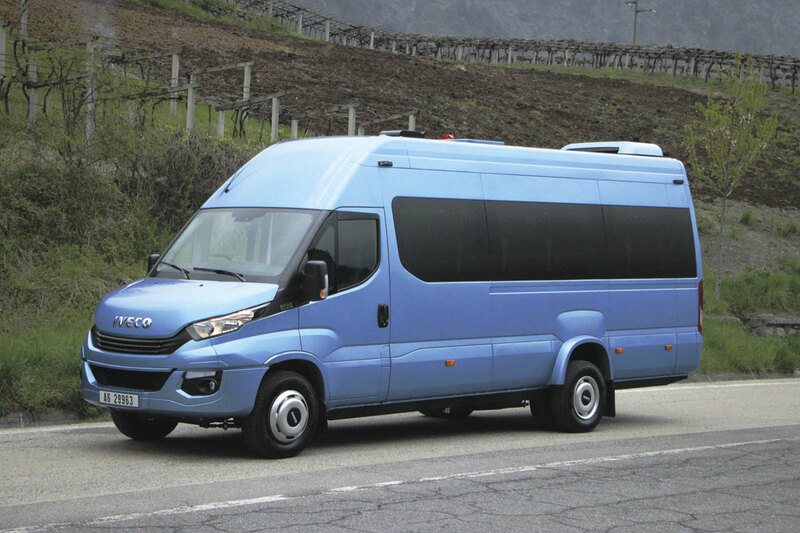 Last year Iveco supplied 85 minibuses in the UK, all of which were seven tonne chassis. Christophe would like to see that figure increase to at least 5% of the 3.5-7.0 tonne market which would equate to around 250 units. For the first time in some years, a dedicated minibus specialist has been appointed. He is Ali Abdi, who has previously spent 18 months with Iveco UK as an intern. Beneath the bonnet is the Iveco F1C Euro6 heavy duty engine developing 180hp and 430Nm of torque. This week’s CV Show in Birmingham was significant in that it marked the debut of the first Daily Tourys + to satisfy ECE R66 rollover requirements, as all such vehicles will have to from 1 November 2017. Since last year this has been mandatory for newly homologated minibuses, hence the need to certify the UK coach which has three point seatbelts rather than the standard two point ones. I had not seen the coach at the time of going to press but I understand that it features a slightly sunken gangway, 19 Kiel Avance (rather than Lazzerini) seats with three point belts and a lateral slide facility. These have a mounting point on the body side. The overhead parcel racks have been raised by 10cm on each side and the 2.5 cubic metre boot is retained. Apparently, the additional structural strength is achieved by reinforcing the pillars, with the result that there is no additional intrusion within the passenger area. I understand it is likely to be the next Kortrijk show before the first left hand drive examples are exhibited. The Daily E6 Tourys features a 2.5 cubic metre luggage boot at the rear. No go ahead for it has yet been given but another development being investigated is an option for a higher/deeper front screen that would greatly improve the view for passengers. Christophe is also developing a new scheme called Busmasters, scheduled for launch next month, which will essentially be a bodybuilder approval scheme for those offering conversions of Daily vans and coachbuilt products on Daily chassis, rather than an approval system for individual conversions. It means that Iveco will have checked the bodybuilder and its systems though it does not involve the base vehicle manufacturer taking on any liability for a conversion. Assessment will be annual and already 20 bodybuilders across Europe have been assessed. The Daily has always been good to drive and these latest developments only enhance this. For chassis versions, nothing in its class or price bracket offers the same power or weight capacity. The moves to take the UK minicoach market more seriously are long overdue and providing they are backed up by the level of aftermarket support that customers expect there is no reason why Daily sales should not rise in future years. PS. Now all they’ve got to do is get that van back down again. Some poor agency driver may be in for a shock!